TRAINING & EDUCATION alternates between academic and sea phases throughout the ner Company upon successful completion of the program. The program. An intensive hybrid vocational program, blending Partner companies train the apprentice on workboat speci? 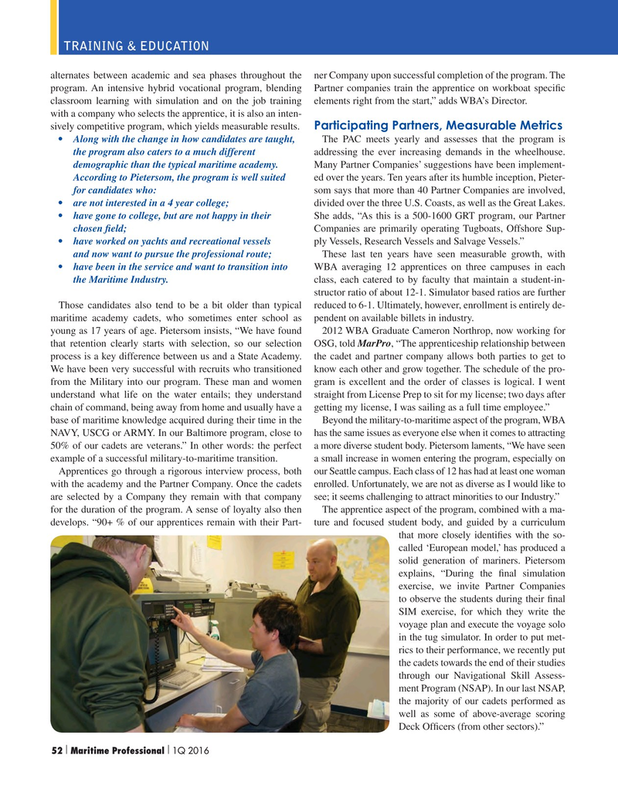 c classroom learning with simulation and on the job training elements right from the start,” adds WBA’s Director. with a company who selects the apprentice, it is also an inten- sively competitive program, which yields measurable results. Those candidates also tend to be a bit older than typical reduced to 6-1. Ultimately, however, enrollment is entirely de- maritime academy cadets, who sometimes enter school as pendent on available billets in industry.